Award-winning painter John Moyers and gallerist-author Dr. Mark Sublette share an affinity for old Hispanic material. The idea to pair the two motifs in a gallery show has been brewing for years and will finally come to fruition this March when Moyers presents up to 25 new works incorporating his premier collection of early Mexican blankets. “Growing up in New Mexico, John fell in love with Hispanic culture and has become a dedicated scholar on the subject, making his paintings an important visual documentary of this period. We felt it would be a unique opportunity for collectors to see his paintings along with the pieces that inspired them together in a single setting,” remarks Sublette, president of Medicine Man Gallery. The show, titled The Art of the Saltillo, opens March 7 with an artist reception from 5 to 7 p.m. Accompanying the paintings will be a display of serapes from the artist’s personal collection along with a few prime examples of 18th- and 19th-century Saltillo blankets for sale as well as early Mexican sombreros, clothing and horse regalia. On March 8, from 2 to 3 p.m., Mark Winter, owner of the historic Toadlena Trading Post and author of The Master Weavers, and Moyers will present a lecture titled The Art of the Saltillo. Seating is limited and reservations are required. Moyers and his wife, artist Terri Kelly, started collecting the long, soft, brightly colored blankets in 1988. Known as serapes— with roots traced to the city of Saltillo in northeastern Mexico—the Moyers have acquired an extensive collection of the woven, multi-patterned textiles with many dating before the American Revolution to as late as the 1920s. “This is the first show I’ve ever done like this where it’s all devoted to one subject matter,” notes Moyers. Each oil painting on display features an intimate view of a Saltillo blanket as either a versatile garment or a decorative accessory. 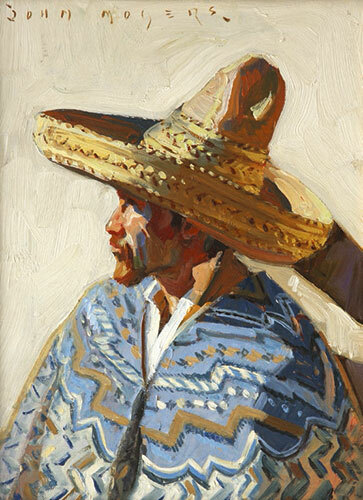 Moyers met the challenge of representing the details of the serape properly while still maintaining the fine art quality synonymous with his work. Like the textile itself, simplistic elements are woven throughout each painting unifying the work. 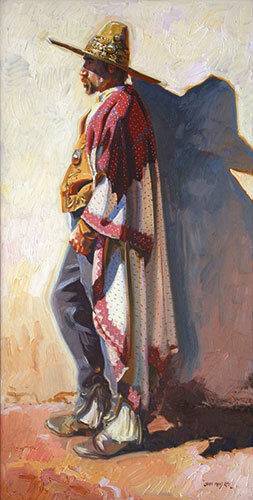 Hombre depicts a simple portrait of a man clad in 1880s attire with a decorative Saltillo draped over his shoulder, while El Zarape Roja is a statement of a stark burro against a light background. “When I think of Mexico I think of that impact: simple starkness,” the artist remarks. The blanket in The Maximilian Saltillo Serape represents one of the artist’s favorite periods to collect and denotes the French influence in both design and materials. “These are very, very rare serapes. And this is a painting of one in my collection,” adds Moyers. 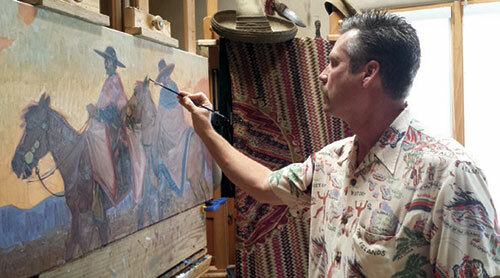 John Moyers developing his latest painting, titled Cochineal and Indigo, in his Santa Fe studio. 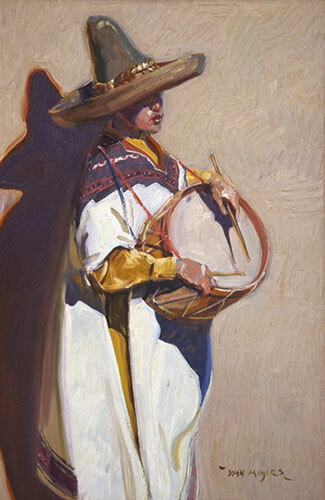 Serapes were prevalent in the early days of California. Moyers’ interpretation of a man wearing a serape in 1840 in Santa Barbara can be seen in the 48-by-24-inch painting titled Santa Barbara 1840. John Moyers, Santa Barbara 1840, oil on canvas, 48 x 24”. Images courtesy Mark Sublette Medicine Man Gallery, Tucson, AZ.